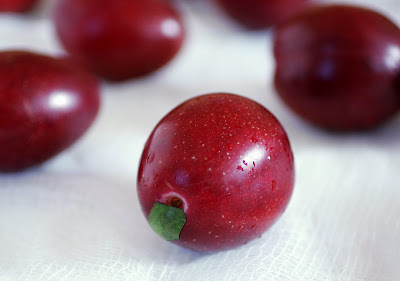 Because my childhood neighbors had two big Italian plum trees, our family was gifted a large supply of plums sometime every August. No one really knew what to do with the plums, and so my father inevitably stewed them and ate them on top of ice cream. 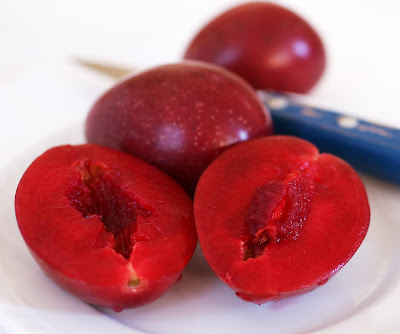 Not an appealing memory, those plums. 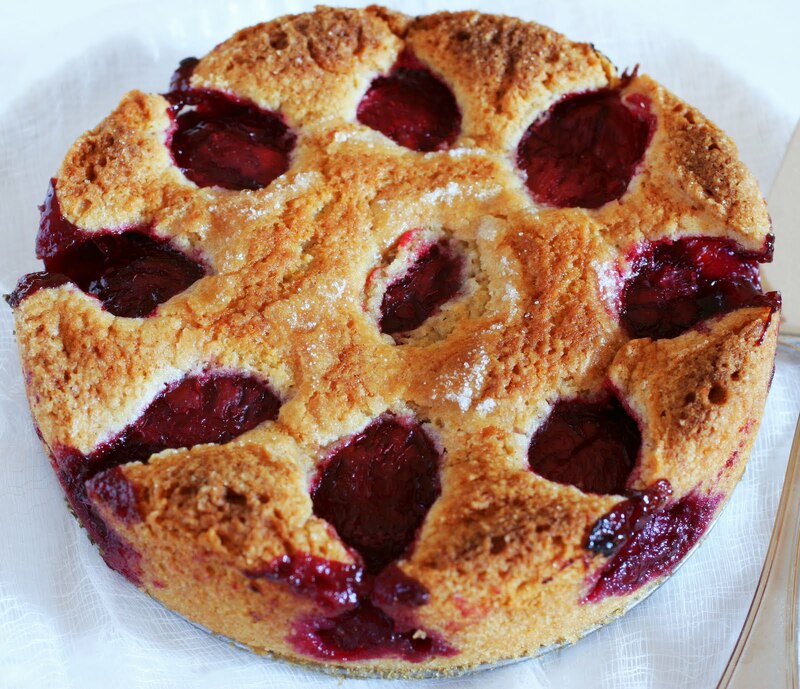 market in my torte, but any red or black plum will work nicely, as long as they’re ripe and juicy. 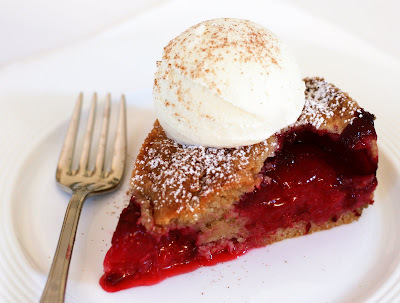 Serve this torte warm, if possible, with a scoop of vanilla ice cream and a sprinkling of cinnamon. 1. Position a rack in the center of the oven and preheat the oven to 350°F. Butter and flour an 8-inch springform pan. 2. In a medium bowl, whisk together the flour, baking powder, salt, cinnamon and ginger; set aside. 3. In the bowl of an electric mixer fitted with the paddle attachment, cream the butter and sugar until light, about 3 minutes. Beat in the lemon zest and eggs, one a time, mixing well after each addition and scraping down the sides of the bowl as necessary. Add the dry ingredients and mix at low speed until blended. Remove the bowl from the mixer stand and give it a few turns with a rubber spatula to make sure it’s well blended. Scrape the batter into the prepared pan and smooth the top. 4. Arrange the plum halves, cut-side-down on top of the batter, fitting in as many as you can. 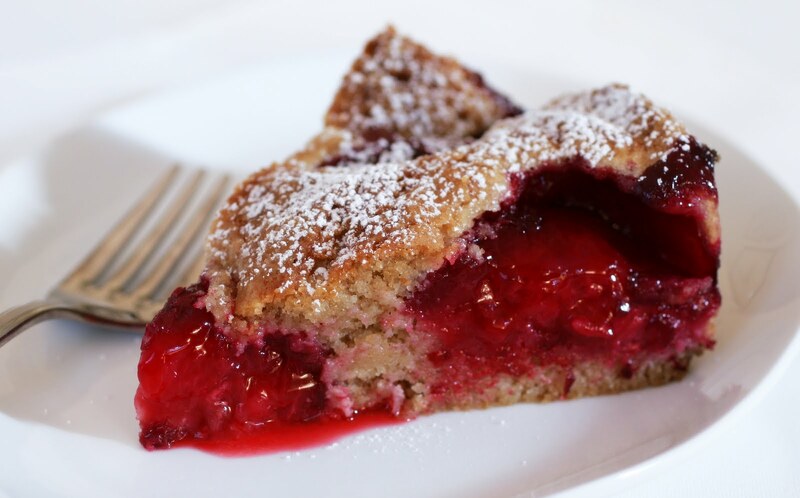 Sprinkle the plums with about 1 tablespoon of sugar and bake for 45 to 50 minutes, or until a toothpick inserted into the center of the cake (avoid a plum area) comes out clean. Cool the cake in the pan set on a wire rack for 20 minutes. Remove the side of the pan and serve the torte warm with vanilla ice cream or whipped cream.